I recently downloaded the Action Movie FX app for iPhone to see what the ratings were all about. Let me say this is a fun little time waster application. Action Movie is a cut scene app that allows the user to add visual effects to their personal iPhone videos. Included in the app are a car tumbling toward a target, a missile impact, and a demolition ball falling. More effects are available in the freemium app. Why is this fun? Imagine sitting in a board meeting listening to that brown noser across the table yammer on and on. Take a quick five second video and align the crosshairs on the screen under the jerk. Then decide his demise. I prefer a demolition ball. Make the selection and the video will be edited. In a second or two you’ll be the star of the meeting when you express your angst to your coworkers by dropping a ball on the man! J. J. Abrams owned Bad Robot Productions has done a great job with this iPhone app, which has definitely helped build hype around the new Mission Impossible movie Ghost Protocol. Doing a quick search on YouTube for Action Movie FX returns over 35,0000 user uploads and counting. If you love destruction and explosions, this app will become a quick favorite. I give this app a 3.5 out of 5 rating. It’s a really fun little time waster, but it’d be the first to go when space gets tight. 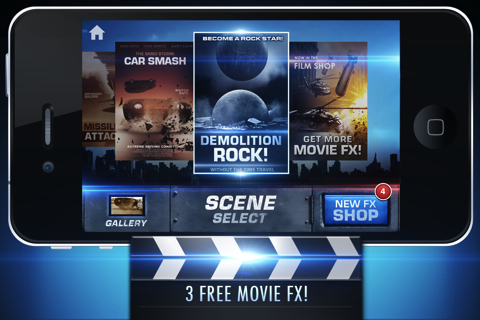 AppSafari review of Action Movie FX was written by Clark Stewart on February 1st, 2012 and categorized under App Store, Free, Fun, Video. Page viewed 6225 times, 1 so far today. Need help on using these apps? Please read the Help Page.